When I was little, I was obsessed with sewing things by hand. My dad and aunt LOVED to go golfing, and one of my proudest childhood creations was making them golf ball bags that I handmade out of pillow cases. Wildly enough, I haven’t thought about that in years until I started writing this blog post. ;) Love that I remembered that! Once in a blue moon, I still sew a thing or two besides the buttons that pop off my shirts or pants! As the cactus trend is at an all-time high, I felt inspired to make this super easy pillow after finding these pom poms at JOANN. Aren’t these pink pom poms AMAZING?! You can sew them on to anything. As a matter of fact, I just used them for this DIY handbag as well! As many of you can probably relate, JOANN is one of the first and main craft stores I frequented during my childhood. To this day, it’s still one of my favorites! I remember filling my basket up with everything from stickers to glitter pens to fabric!!! I was like a kid in a candy store! Fast forward to many years later, and here I am at another trip to JOANN! This time around, I ended up finding this perfectly pink and white polka dot fabric. I just knew it would go really well with Claire’s nursery design. This took me about 45 minutes to sew by hand. You can easily whip this out while watching one of your favorite shows! As Christmas is ONLY 22 weeks away (wink), you could even start crafting these for your friends and family! ;) Just saying!! It’s wild how far a few pom poms, a glue gun, sewing needles, fabric, and thread will take you! ;) Any other sewing girls out there?! What is the craziest thing you’ve ever sewn? I want to know!! 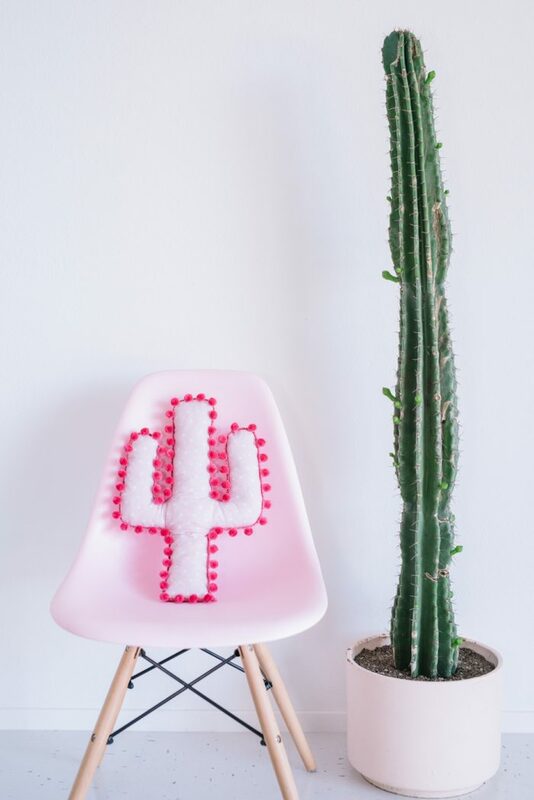 Cut out your cactus shapes (2) from your pink polka dot fabric. Pin your pieces of fabric together with the patterned sides on the inside. Using your needle and thread, hand-stitch all the way around your pillow leaving 3 inches open at the end. Then, carefully turn your fabric inside out to reveal the patterned side. Fill your pillow with cotton. Stitch the open end shut. Hot glue your pom poms around your pillow. Do you have a pattern for the cactus? I am so sorry I don’t. I will have to keep in mind when creating future tutorials. I would love to have a pattern, if you ever post one! I love your ideas! Thanks!